Necklace comprised of an antique vintage steel skeleton key combined with a hand cast pewter charm with a flower motif, hanging from a vintage stainless steel chain. The keys measure 1 3/4" (#1) or 1 7/8" (#2). See last photo. 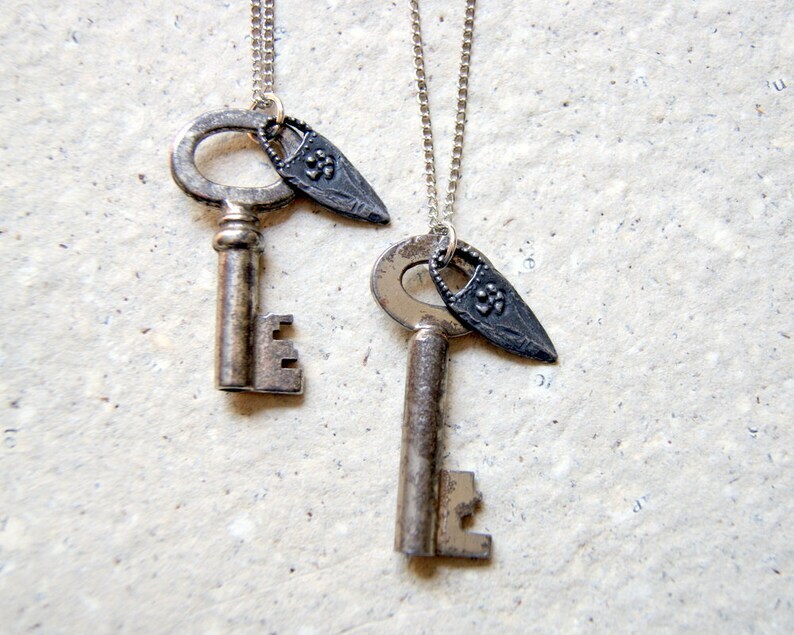 Part of my Secret Garden key series. The necklace measures 23 1/2". IG: @wearyourwildYou can see current samples of my gift wrap on my About page: https://www.etsy.com/shop/WearYourWild?ref=hdr_shop_menu#about Leave a message in the 'note to seller' box when you check out telling me which paper you'd like. If you don't leave a message, I'll choose one. Thanks for supporting handmade! You can see my current gift wrap samples on my about page. Leave me a message when you check out to let me know which paper you'd like. If you don't leave a message, I'll happily choose one for you.